Staying Positive In Trying Times - All Things Special Ed. We all have those days where we question what we are doing and why are we still teaching. But to be honest, there is nothing else I would rather do than be a special education teacher. Even though there are times where I come home swamped in paperwork, dealing with "that" parent or when a student had a rough day, I try to stay positive and remember those kids need us. Because if not us then who? 1. 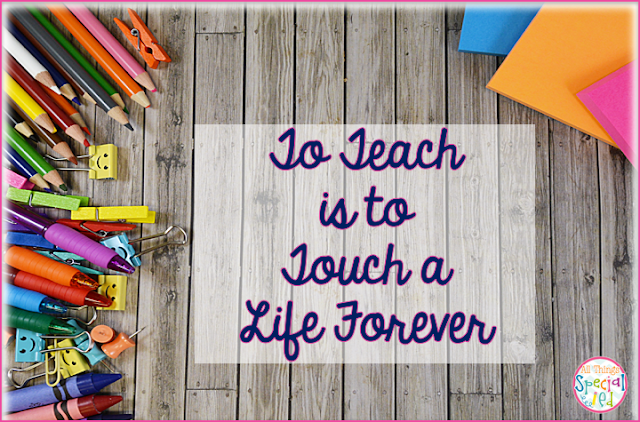 Remember why you love teaching! I remember why I went into teacher; I love working with kids. I love seeing those "ah-ha" moments! I also love the flexibility of being a special education teacher and how no one day is the same! Before having kids (I have two cute little twin boys! ), I was more available to help out with after school activities and special nights. Now with having my own kids, it is a lot harder for me to do that and be a mom to my kids. So I say "No" or limit myself to one thing a year. I know that when they get older, I will be able to come back to helping out more and being able to say "yes" to those volunteer options but for now, I am okay with saying "no". Don't get in the negativity that can loom (i.e. teacher lounge gossip) around during these trying times (standardized testing, work load, politics) but instead help each other out! Send out a positive note to a new colleague or offer help, in return that will help you. I learned early on (during my student teaching) that I would get burnt out if all I did was come home to do more work. Yes there are times I have to stay a little later to plan a new lesson or unit or to get caught up on IEP paperwork but that is (and should be) rare. I just don't do it. I use my time at work to be productive so I know that when I am home I can be present and with my family. Want to read more? Check out these blogs on staying positive with students and staff! I love your thoughts on this topic, Lisa. The title is appealing, too. I really want to not bring work home... but if I don't I wouldn't get anything done. I work for several hours at home each night and I am STILL way behind! I need a secretary or something!